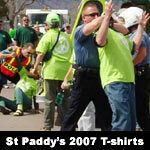 DENVER, COLORADO- It started with a cop falling off his motorcycle, being pushed it’s alleged, by a bicyclist. 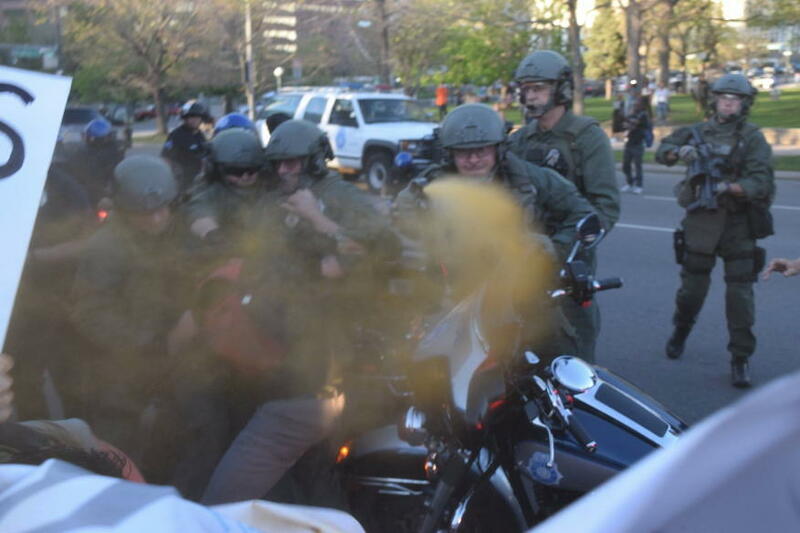 Paramilitary officers piled on the cyclist while playing Orkin Man to Civic Center Park’s infestation of free speech. 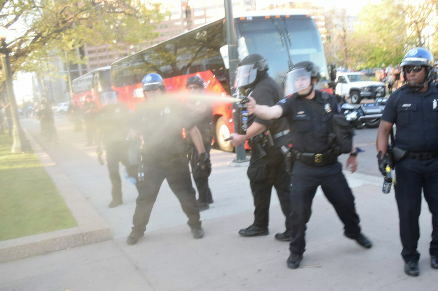 Photos from Denver’s April 29 march against police violence reveal that pepper spray was used less to disperse the hundred or so marchers than to repel Youtube bites. Photos by Patrick Jay and Jason Metter. Although the marchers had already been herded back unto the sidewalk, militarized state troopers laid down a smokescreen of spray to create a no man’s land around their arrestee. The march was 2% black, but the DPD chose from the 2% minority for the first arrests. 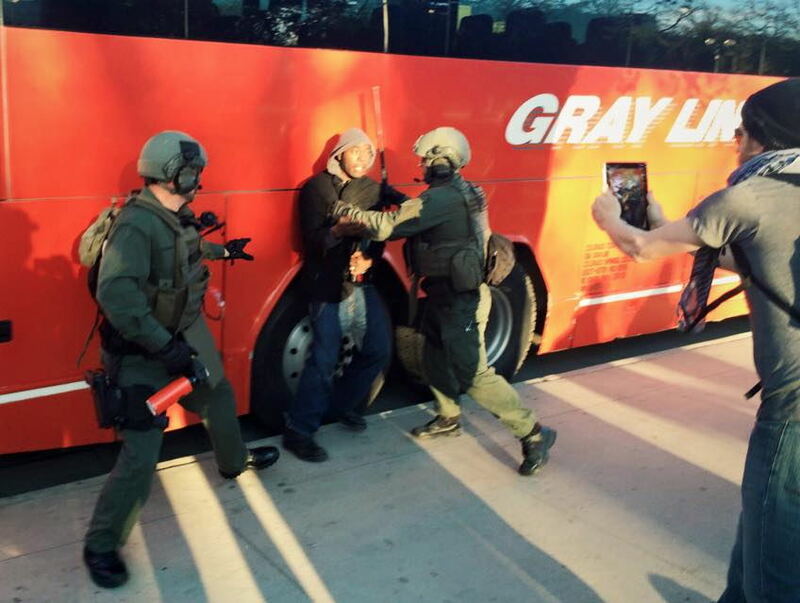 Here activist Al Nesby has been pulled from the crowd while tablet-bearing witness David Long records the irony. An officer assists in Al’s arrest by directing pepper spray at David whose perspective was apparently too up close and personal. 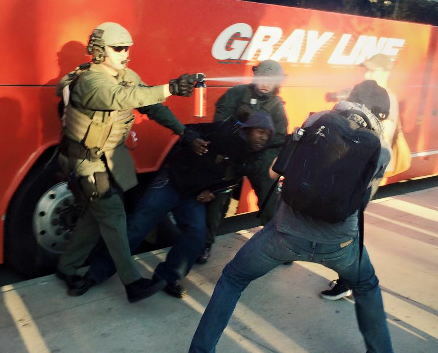 The officer also arcs his spray toward photojournalist Tanner Spendley. 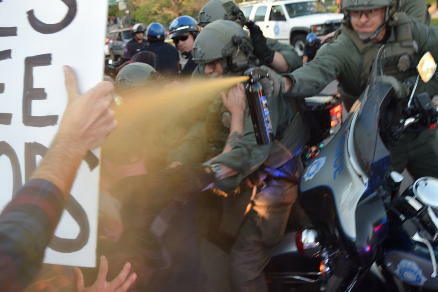 Here officers spray an activist who was only mouthing off. 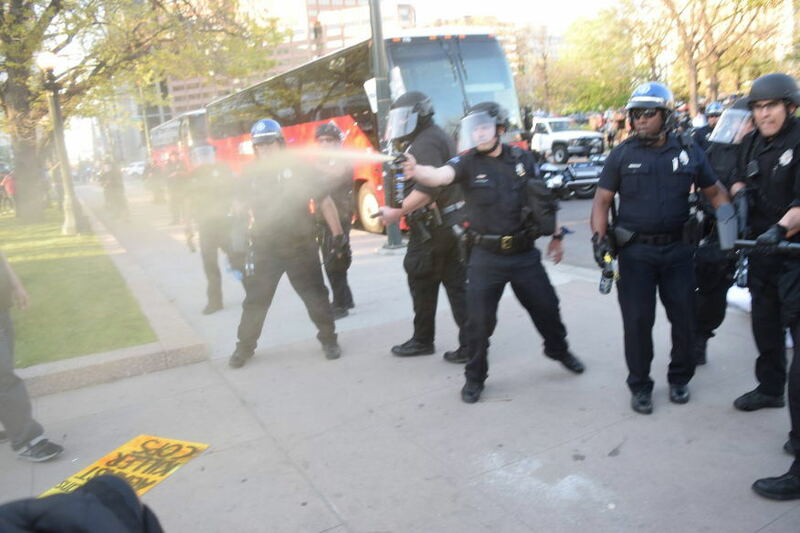 When the DPD aimed their pepper spray at individuals, it was because they bore cameras. Otherwise the spray seemed intended to fumigate. 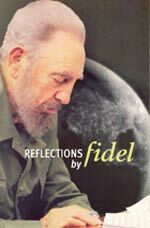 At no time were police officers under attack or trying to break apart a stubborn crowd. 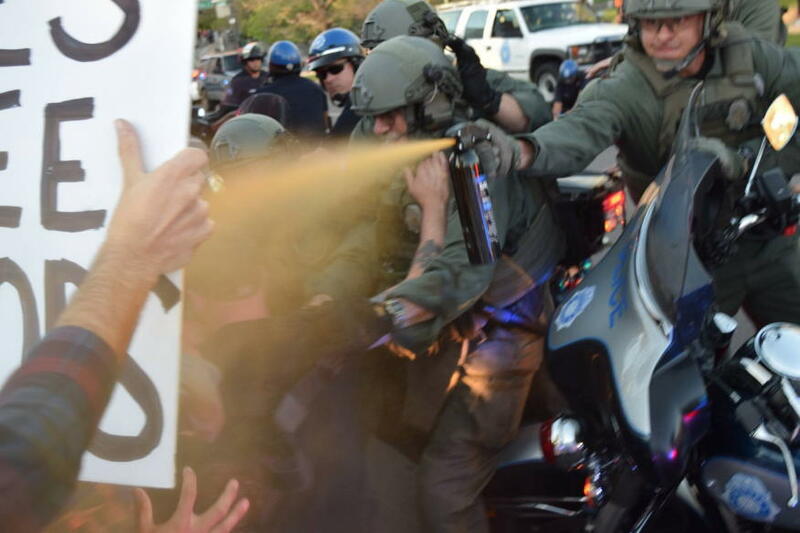 The pepper spray was dispensed like backwoods insect repellent toward an unseen foe whose sting the officers feared. I believe the cops intended to attack us from the moment the march began. 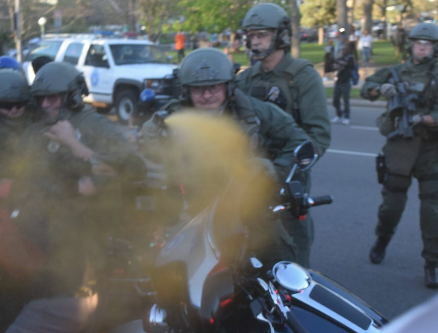 The cop who dropped his motorcycle, unprovoked, started a mini cop-riot by pretending to have been pushed. 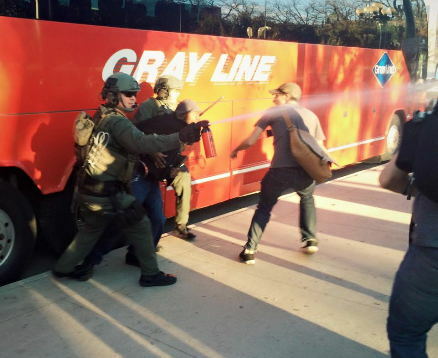 I did not see any protestors take aggressive actions against the cops. 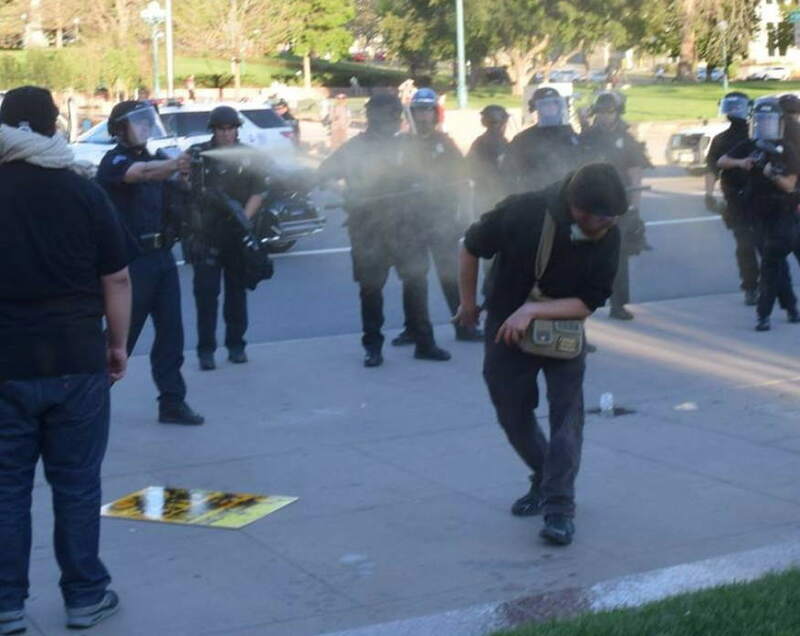 It seems the cops pepper sprayed us to prevent us from photographing and filming them and to punish us for not being meekly obedient to their unreasonable orders. Even as the clouds of cayenne aerosol appear distant in these photos, each debilitated the nearby subjects and required rinsing of clothes, hands and faces. Production note: all photographers were harmed in the taking of these pictures. Is Dzhokhar Tsarnaev guilty of a worse crime than US forces commit overseas? Reading Eris’s story and seeing Jay/Metter photos, It’s hard to believe these THUGS hide behind the motto Serve an Protect. That’s like the Mafia claiming to be a prayer group.